Off-road vehicles and fireworks are two things that bring great fun to our lives. Mixing the two, though, can be a questionable move, as a Jeep Wrangler driver in Maryland celebrating the 4th of July learned the hard way. 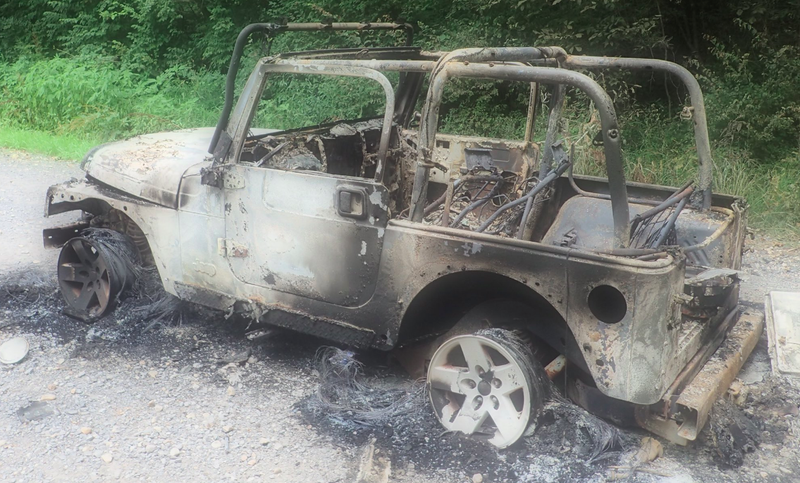 Pete Piringer, the Chief Spokesperson for the Montgomery County, Maryland Fire and Rescue Service tweeted a few photos yesterday showing a Jeep Wrangler TJ (the generation from 1997 to 2006) burned to the ground. Quite literally—The frame appears to be resting on the gravel road. Piringer said in that tweet that the cause of the carnage was “discharged fireworks in vehicle,” and that of the roughly two dozen people investigators believe to have been near the vehicle during the incident, some attempted to extinguish the fire, but none contacted the fire department. The tweet estimates damages of over $5,000, which is fair to say, because even a shitbox Jeep Wrangler TJ costs that much. In a subsequent tweet, Piringer wrote “Charges Pending......,” tagging the Montgomery Fire Department, the Maryland Department of Natural Resources and the Montgomery County Office of Fire & Explosive Investigations. Luckily, Piringer says there were no injuries associated with this fire. Though it’s still depressing to see what appears to be the most capable version of the Jeep Wrangler TJ, the Rubicon trim (based on the wheels, rocker guards and what appears to be like a melted decal on the side of the hood) burned to a crisp. I wonder if I could buy it for cheap. Sucky Thing About Cars? They Catch Fire.